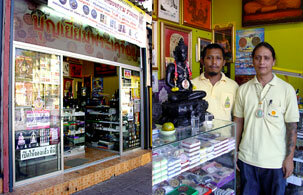 Boonyium Thai Buddha Amulet, Thai Buddha amulets shop located in the heart of Patong Beach. We serve Thai Buddha amulets as well as the latest Thai amulet or the oldest with more amulet equipment collections such as silver and stainless locket, necklace and so on. We are guaranteed 100% to all every Thai amulet and product from us that are real. Every product from Boonyium Thai Buddha Amulet is recited incantations by the best famous monk in sphere of Thai amulet certainly… approved by Jeth Look Klom.